Harvard Professor Karen King with the previously unknown papyrus fragment that, when translated, contains “Jesus said to them, my wife.” “This new gospel doesn’t prove that Jesus was married, but it tells us that the whole question only came up as part of vociferous debates about sexuality and marriage," said King. Four words on a previously unknown papyrus fragment provide the first evidence that some early Christians believed Jesus had been married, Harvard Professor Karen King told the 10th International Congress of Coptic Studies today. King, the Hollis Professor of Divinity at Harvard Divinity School, announced the existence of the ancient text at the congress’ meeting, held every four years and hosted this year by the Vatican’s Institutum Patristicum Augustinianum in Rome. 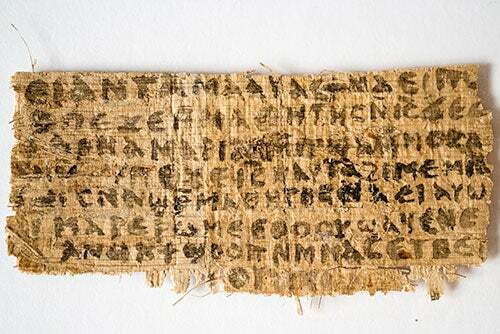 The four words that appear on the fragment translate to “Jesus said to them, my wife.” The words, written in Coptic, a language of Egyptian Christians, are on a papyrus fragment of about one and a half inches by three inches. Roger Bagnall, director of the Institute for the Study of the Ancient World in New York City, believes the fragment to be authentic based on examination of the papyrus and the handwriting. Ariel Shisha-Halevy, a Coptic expert at Hebrew University in Jerusalem, considers it likely to be authentic on the basis of language and grammar, King said. Final judgment on the fragment, King said, depends on further examination by colleagues and further testing, especially of the chemical composition of the ink. One side of the fragment contains eight incomplete lines of handwriting, while the other side is badly damaged and the ink so faded that only three words and a few individual letters are still visible, even with infrared photography and computer photo enhancement. Despite its tiny size and poor condition, King said, the fragment provides tantalizing glimpses into issues about family, discipleship, and marriage that concerned ancient Christians. King and colleague AnneMarie Luijendijk, an associate professor of religion at Princeton University, believe that the fragment is part of a newly discovered gospel. Their analysis of the fragment is scheduled for publication in the January issue of Harvard Theological Review, a peer-reviewed journal. King has posted a preliminary draft of the paper, an extensive question-and-answer segment on the fragment and its meaning, and images of it, on a page on the Divinity School website. The brownish-yellow, tattered fragment belongs to an anonymous private collector who contacted King to help translate and analyze it. The collector provided King with a letter from the early 1980s indicating that Professor Gerhard Fecht from the faculty of Egyptology at the Free University in Berlin believed it to be evidence for a possible marriage of Jesus. King said that when the owner first contacted her about the papyrus, in 2010, “I didn’t believe it was authentic, and told him I wasn’t interested.” But the owner was persistent, so in December 2011, King invited him to bring it to her at Harvard. After examining it, in March King carried the fragment to New York and, together with Luijendijk, took it to Bagnall to be authenticated. When Bagnall’s examination of the handwriting, ways that the ink had penetrated and interacted with the papyrus, and other factors confirmed its likely authenticity, work on the analysis and interpretation of the fragment began in earnest, King said. Little is known about the discovery of the fragment, but it is believed to have come from Egypt because it is written in Coptic, the form of the Egyptian language used by Christians there during the Roman imperial period. Luijendijk suggested that “a fragment this damaged probably came from an ancient garbage heap like all of the earliest scraps of the New Testament.” Because there is writing on both sides of the fragment, it clearly belongs to an ancient book, or codex, and not a scroll, she said. The gospel of which the fragment is but a small part, which King and Luijendijk have named the Gospel of Jesus’ Wife for reference purposes, was probably originally written in Greek, the two professors said, and only later translated into Coptic for use among congregations of Coptic-speaking Christians. King dated the time it was written to the second half of the second century because it shows close connections to other newly discovered gospels written at that time, especially the Gospel of Thomas, the Gospel of Mary, and the Gospel of Philip. Like those gospels, it was probably ascribed to one or more of Jesus’ closest followers, but the actual author would have remained unknown even if more of it had survived. As it stands, the remaining piece is too small to tell us anything more about who may have composed, read, or circulated the new gospel, King said. The main topic of the dialogue between Jesus and his disciples is one that deeply concerned early Christians, who were asked to put loyalty to Jesus before their natal families, as the New Testament gospels show. Christians were talking about themselves as a family, with God the father, his son Jesus, and members as brothers and sisters. Twice in the tiny fragment, Jesus speaks of his mother and once of his wife — one of whom is identified as “Mary.” The disciples discuss whether Mary is worthy, and Jesus states that “she can be my disciple.” Although less clear, it may be that by portraying Jesus as married, the Gospel of Jesus’ Wife conveys a positive theological message about marriage and sexuality, perhaps similar to the Gospel of Philip’s view that pure marriage can be an image of divine unity and creativity. From the very beginning, Christians disagreed about whether they should marry or be celibate. But, King notes, it was not until around 200 that there is the earliest extant claim that Jesus did not marry, recorded by Clement of Alexandria. He wrote of Christians who claimed that marriage is fornication instituted by the devil, and said that people should emulate Jesus in not marrying, King said. A decade or two later, she said, Tertullian of Carthage in North Africa declared that Jesus was “entirely unmarried,” and Christians should aim for a similar condition. Yet Tertullian did not condemn sexual relations altogether, allowing for one marriage, although he denounced not only divorce, but even remarriage for widows and widowers as overindulgence. Nearly a century earlier, the New Testament letter of 1 Timothy had warned that people who forbid marriage are following the “doctrines of demons,” although it didn’t claim Jesus was married to support that point. In the end, the view that dominated would claim celibacy as the highest form of Christian sexual virtue, while conceding marriage for the sake of reproduction alone. The Gospel of Jesus’ Wife, if it was originally written in the late second century, suggests that the whole question of Jesus’ marital status only came up over a century after Jesus died as part of vociferous debates about sexuality and marriage, King said. King noted that contemporary debates over celibate clergy, the roles of women, sexuality, and marriage demonstrate that the issues were far from resolved. Staff writer Alvin Powell contributed to this report.